Anthony Carter has had a hard life, growing up with a single mom that had to work two jobs. Anthony went to college at MIT thanks to scholarships, but things went downhill fast. And then his mom dies and he is back home in Montana waiting tables. A trip to Vegas with some friends to forget his worries for a little while and Anthony ends up at the bar alone and sitting next to a beautiful woman. Liz Rockwell has lived the pampered life. Being the heiress to the Rockwell Candy Company, but she went to law school and is living a life that is independent from the family money. She doesn't want the money, she wants to make her own way and is doing a good job of it and making a name for herself. Liz is in Vegas for a girls’ vacation, but the other two girls are MIA. Mags and Charlotte are not coming, so Liz is sitting at the bar drinking by herself when a handsome man sits beside her. They begin to talk about whose sad story is worse. The laughing and fun they both were having was topped off with a bottle of scotch. When both wake the next morning, in the same bed, they notice they are married but neither can remember anything after opening the bottle of scotch. While they both agree to end the marriage, that is until one of Anthony's friends tells him who she is. And Anthony thinks he has found a way to end his mounting debt. When that doesn't work, he wants them to spend time together, get to know each other, so he can learn some secrets to get the money without Liz having him arrested for trying to extort money from her or her family. Can Anthony make Liz see that they can actually be good together? Will Liz trust her feelings and follow her heart? Will she give Anthony his 21 days or will the pain from her last relationship not let her move forward? This is a debut novel for Natalie Rios and I found that I really enjoyed it. It had me laughing, crying, and even on the edge of my seat wondering what Liz was going to do. So sit back and enjoy it too. This book had a lot of potential and the more I read, the better it got. The beginning was great, wake up married in Vegas. How awesome is that? Then the parties agree on a quickie divorce because, hey – who stays married after a quickie marriage in Vegas? Things quickly go downhill when Anthony's roommate, Thomas, discovers that his new wife, Liz, is one of those Rockwells, as in the Candy Rockwells. And so begins a quest to get his new, rich wife to pay off his student loans and dead mother’s outstanding medical bills. Once the ick factor wears off, we see two people who are compatible and seem to genuinely like each other. I would have liked to see Anthony be more independent and less whiny when he first showed up in Miami. Would I read the next book in the series? Yes. This is an enjoyable read, with a definitely desirable outcome. I found the journey to be a little up and down – mainly because I couldn't quite get into the lead characters' reasons for their behaviour towards each other. We get both their points of view, but there is very little passion even in their internal voice. From both of them it is possible that it had been forced out of them by circumstance, but I couldn't quite believe it. That said, I thought the set up was successful, the way that the twist worked was good, and I look forward to some of the side characters getting their stories told – Charlotte in particular. 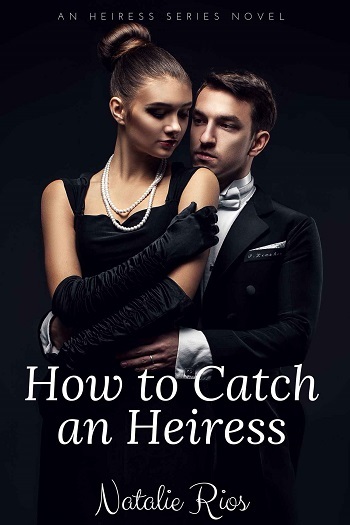 Reviewers on the Wicked Reads Review Team were provided a free copy of How to Catch an Heiress (Heiress #1) by Natalie Rios to read and review.